“I have named my donkey Super Power because it never refuses or disappoints in transporting heavy items across long distances. It understands every word of mine addressed to it and always replies in the affirmative. Its only drawback is that it can’t speak,” were the words of Yaqoob, a young man in his early 20s who owns a donkey cart and brings it daily to Jodia Bazaar, the busiest, oldest, market of the metropolis. Camel carts have perhaps been used to transport heavy goods in Karachi since it was a small town prior to its takeover by the British in the18th century. Although this ancient mode of transportation can still be seen in certain parts of the city, it is now becoming a rarity. The city’s legendary camel carts and their drivers gained international attention and fame when then US Vice President Lyndon B Johnson visited Karachi in 1961 and invited Bashir Saraban, a camel cart driver from Karachi, to visit the US and experience American hospitality. “A camel is like a woman – you never know what it is going to do next,” was the reply of Bashir, who embarked on his fairytale US tour on Johnson’s invitation when he was asked about his camel by his hosts at a reception. Super Power is one of the hundreds of donkeys tied to carts that are brought to Jodia Bazaar and adjoining markets every morning; the donkeys are used for the purpose of shifting heavy cartons and sacks of rice, spices, dates and similar items to nearby shops and other markets in the city. Labourers have their donkeys compete with one another while mechanised loading vehicles can’t move freely in the narrow, crowded lanes of areas in the old city. Donkey carts are the preferred mode of transportation for many businesses in Karachi especially in the markets, transporting construction material including building blocks, sand, gravel, steel, cement and even water while most of the traditional dry cleaners (dhobis) still use donkey carts to collect dirty clothes from homes and deliver them after washing and cleaning. During a visit to the old city area, several donkey cart owners were seen sitting idle inside the narrow lanes of Jodia Bazaar and Boulton Market as, according them, they were facing difficulties in finding work these days — many a time having to return empty handed to their homes. “I had purchased Super Power for Rs15, 000 and the cart for Rs 7,000 a couple of years back and since then, it has been earning bread and butter for my entire family. I’m the sole bread earner for my family and without the donkey, this would have been immensely difficult,” says Yaqoob, who travels each day from Muach Goth to Chakiwara, Lyari and then to Jodia Bazaar for work. In the evening, Yaqoob takes back his donkey cart to Chakiwara, where a person has established a stable for keeping horses for the night. “I tie Super Power at the intezaam (stable) every night for Rs 20 per night and go back to my residence in Muach Goth. In addition to these charges I also have to pay to arrange food and water for the donkey,” he elaborates. As far as the eating habits of donkeys are concerned, donkey owners say they give them food and water twice a day, in the morning before going to the work and in the evening or night, at the end of their working day. 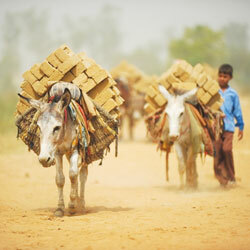 “They (donkeys) never ask for food during working hours if their bellies are kept full in the mornings and evenings. In winters they don’t even ask for water but in warmer days, they need water, for which we have to make arrangements as water becomes a scarce commodity in bazaars such as Jodia Bazaar and old city areas,” he informed. Elderly Abdul Majeed is another donkey cart owner who calls his donkey Badshah - a very common name for donkeys employed in this profession - who says he prefers to starve at night but do everything to feed Badshah, which cannot ask for food and never protests while carrying and transporting heavy loads across long distances. “Most of the owners respect their donkeys and fulfill the needs and requirements of their animals. For me, Badshah is like a family member. If it becomes sick, I arrange for its treatment like I would for my children. Without it, I cannot think of living and earning a few hundreds rupees daily for myself and my family,” says Abdul Majeed, who has been working as a donkey cart owner for several decades. Recalling the old days, Abdul Majeed and others of the same trade say there used to be places in the old city areas like Kharadar, Lyari and adjoining areas where local philanthropists, mostly Hindus and Parsis, had established small ponds and troughs for animals including donkeys, horses and camels - the preferred mode of transportation in those days. “All those ponds and watering holes have now been demolished by greedy people. There is still a place in the Bheem Pura area where donkeys and other animals can quench their thirst but that too is being managed by a non-Muslim. Otherwise, Muslims here don’t believe in doing anything for the animals,” he says. Many main arteries and roads in the city have been declared “No-Go areas” for donkey cart owners by the traffic police, especially Shahrah-e-Faisal, but donkey cart owners say they agree to go anywhere to transport goods as it is the only way out for them. As far as the prices of donkeys are concerned, Yaqoob says the price of a donkey varies from Rs10, 000 to Rs150, 000 depending on its size, colour, beauty and ability to carry weight - and owing to their prices, donkeys gain value in the eyes of both owners and thieves. “A few months back, several donkeys were stolen from the Lyari area but their owners managed to find and rescue them. Usually, their sale and purchase is done at Bakra Peeri every Sunday where they are traded on mutually agreed prices,” says Abdul Majeed. Cart owners say that donkeys are brought to Pakistan from Iran or from the interior of Sindh while their prices also depend on their breed; some types of donkeys are preferred over others. A lot of people are associated with the provision of fodder for animals, especially donkeys in the city, who arrange and sell dried hay, green grass and cereals to donkey-cart owners. “Keeping a donkey is not easy for us. The animals consume food worth Rs. 80 to Rs. 150 twice a day and that cannot be missed at any cost. I can sleep a night without food if I haven’t got work on a particular day but my donkey never understands this. It needs the food in the morning and the evening irrespective of weekly holidays, national and provincial holidays and strikes, a common feature in Karachi and a significant hurdle for those who depend on daily wages,” declares Abdul Majeed. 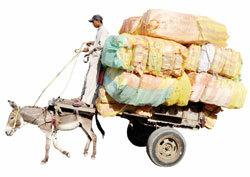 Today, the camel cart in Karachi is gradually vanishing and is hardly seen on city roads these days. They have now been replaced by more efficient and faster loading trucks and vans, which carry more weight and travel longer distances in far shorter time than the slow-moving camel carts. However, a few dozen camel carts still operate in the megacity these days, mostly in the old city areas of Lyari and Kharadar. One can also catch a glimpse of camel carts moving on the Mauripur road, shifting sacks and cartons of various goods to and from warehouses established in the area. “Earning a respectable livelihood through a camel cart has become immensely difficult these days as people now prefer trucks and vans to shift their goods. Many of the camel cart owners have sold their camels and carts as they cannot earn enough to feed both their families and camels at the same time,” says Ali Ahmed, who owns a camel cart but is facing difficulty finding work and making ends meet these days. “Although a camel pulling a cart can shift 60 to 80 maunds (240 kgs to 300 kgs) of weight, it occupies more space on the roads and moves at a snail’s pace, causing traffic jams. With many more vehicles on the roads these days than only a few decades back, people are less interested in hiring an ‘Oonth Gaari’ (camel cart) for transporting their merchandise,” Ali Ahmed says wistfully. According to him, he can find no work for many days in a month so he is now forced to carry weights on his back as a labourer to earn some money to feed both his family and the camel. Keeping a camel in the city is becoming very difficult these days for many reasons including the growing price offeed and fodder for the animals. “Feeding camels is becoming an ordeal for camel owners these days when they themselves are facing difficulty in feeding their families. A camel normally consumes fodder and grams worth several hundred rupees in a day while making a living through them is becoming more difficult with each passing day,” he says. Ali Ahmed, who lives in Agra Taj Colony in Lyari off the Mauripur road, says he keeps his camel and cart outside his home along the abandoned railway track. Some days in a week, it remains tied in the same place for hours due to the protests on the Mauripur road, which has become a favourite spot for protests by Lyariities. Ali Ahmed’s camel is still worth Rs 100,000 due toits good health and ability to pull carts weighing several hundred kilograms. But its owner feels that this profession is now becoming old-fashioned and outdated. “I am trying to sell the camel along with the cart and buy a loading vehicle but I’m not being offered the desired price. Some people have shown an interest in buying his cart and animal it but he still does not have enough money to purchase a Suzuki or small truck,” he grieved. Another camel cart owner, Abdul Kareem, was also not satisfied with his profession and according to him, earning a living with the help of a camel was becoming an uphill task in Karachi where life had become really fast and mechanised due to the proliferation of diesel-powered loading vehicles. “I’m seriously considering selling my cart and using the camel to provide rides to children on the beach as that would earn me enough to feed my family and the camel. The camel cart as a means of transportation is simply not feasible these days” he adds. He said some of his friends had already abandoned plying camel carts. Some had sold their camels while a few of them were now taking their camels to the beach in the evenings and earning handsome amounts to feed their families. “The days are not far away when you will not see a single camel cart or camel in the city where there were once hundreds of camels earning bread and butter for their owners. Unfortunately, there is no place nearby where camels can be taken for grazing in this urban jungle which means that extra money is incurred on feeding them,” he laments.